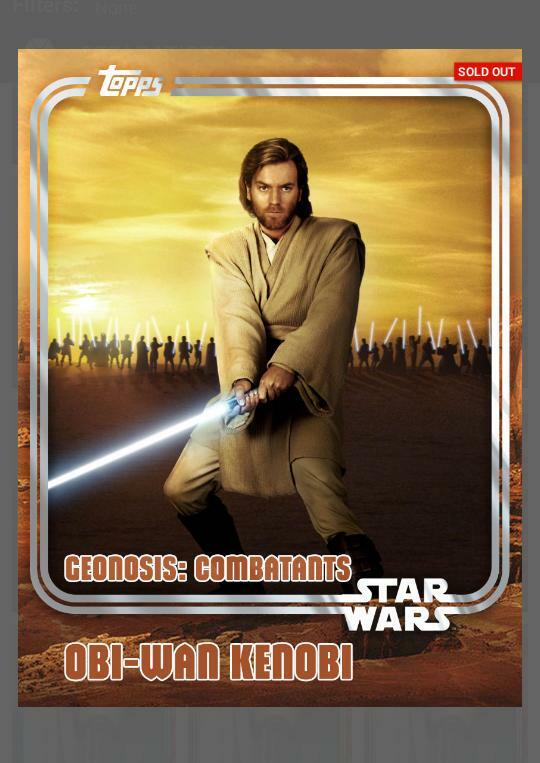 Welcome to MakingStarWars.net’s weekly Star Wars Card Trader Round-Up #5 for the week of August 17th through August 23rd where we bring you news, tips and a look at our week. For SWCT fans, our podcast, “Now, This Is Podcasting!” has a very special giveaway going on right now! Be sure to download the podcast and submit your entry to potentially win 1 million credits! 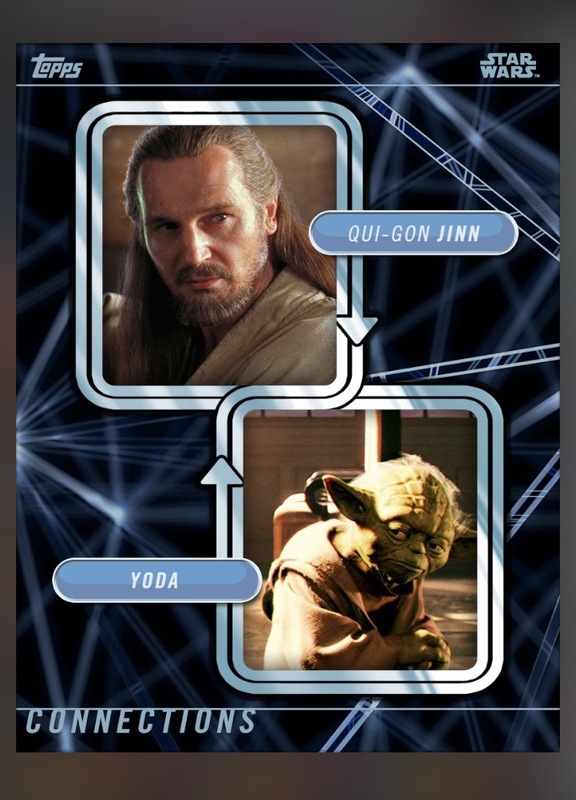 To enter – Tweet @ToppsDigital and @MakingStarWars with your #SWCT fan name and your favorite card. 1 winner will be selected to win 1 million credits, and 3 other winners will be selected to win 500k credits each. Tweet now! It was a quiet week. Too quiet. Classic Art and 1977 received their Award Cards this week. The 77 Award Cards were a massive 11 card set consisting of 11 reproductions of the stickers from the original Series 1 Topps release. It was an amazing award and truly one worthy of the effort it required to get these cards every day. Light Side and Naboo came to an end but there haven’t been Award Cards issued for those sets yet. And oddly, the deadline for Wave 2 of Galactic Moments was a week ago, but no Award Card has been issue yet as of this writing. Like we mentioned early, it was a quiet week. With Galactic Moments being a non Marathon insert, I was able to save creds that I would normally use to chase that and go after Vintage. I was extremely lucky. I didn’t want the Lobot, but I wanted to get the Lobot so I could flip it for the Vintage Rancor that I failed to achieve last week. With 80k credits on my phone, I was able to pull a Vintage Lobot and immediately flipped it for the Vintage Rancor I wanted. Other than that, I was able to stay current on the sets I collected and went after old sets that I had always loved but had never been able to get. I now have a complete set of white Hoth and Geonosis plus Awards and they are some of my favorite sets that have ever been released on Star Wars Card Trader. My week was also a quiet week. Apart from the usual Icons drop and completion of Naboo sets, I have become addicted to chasing the marathons. I am two cards short of being totally caught up on Wide Vision, however one of those cards is the white whale Obi-wan. More than likely this will be the only one missing from my collection. My favorite day has become Vintage Thursday. I love the look of these cards and think the set hits on all different types of characters from the OT. I was able to pull 2 Lobots, which I flipped one for the new Wide Vision, and pulled an extra Wide Vision and traded it to Mark. All in all another solid week. As Mark and Dru have said, it’s been a quiet week, but also a strange one. We saw two Storyboards drop and no Space Paintings. There were two Prisms which I liked and successfully pulled. Other than that, I would characterize the week as base variant week. We saw base variants in all sorts of colors, including rainbow, teal, green and of course the uber scarce Pink. I don’t collect any base variants so it was kind of a slow week on my end. However, instead of just saving my credits like a smart investor, I ended up chasing (unsuccessfully) the Connections and Wide Vision and wasting my precious credits trying to get cards for sets I’m not even chasing. Let that be a lesson to all you traders – try to resist the temptation to chase cards out of sheer boredom! The tip this week is something that took me some time to learn. It involves patience and uses the “Gotta Have It Now” mentality of Star Wars Card Trader to your advantage. Like everyone else, I want the new insert as well, but if you wait, you’re often able to get many of the inserts you have missed for less credits. Here’s how it works and I’ll detail an exact situation of where it worked for me. 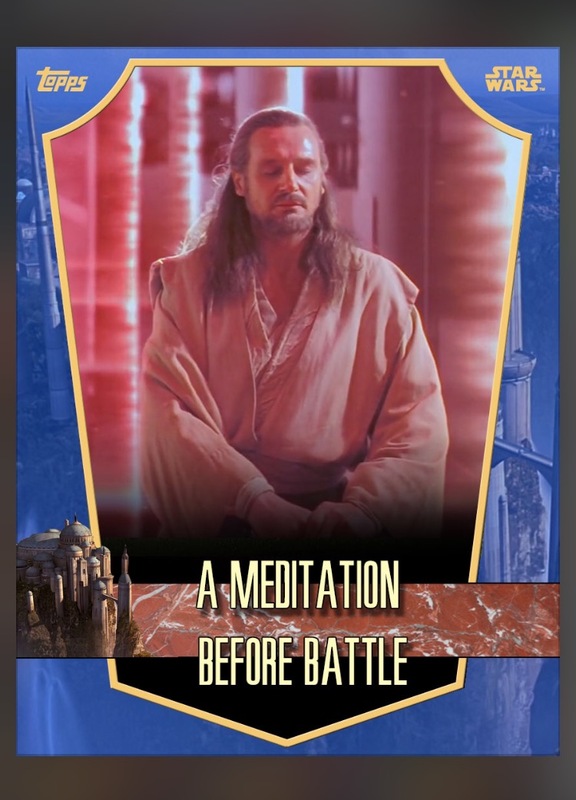 With many sets, there are often two or three active inserts in a pack at any given time and such was the case with the Naboo Set. There were two “older inserts,” Battle Droids and Gungan Sentry, and another insert, Boss Nass, just dropped. So now there were three inserts I needed. So I opened a pack and lo and behold I get Boss Nass. Because it is the newest and therefore most sought after card, I was able to flip it for the the prior two I missed. So, less credits spent, and more cards received. This also involves never opening an insert pack if there are still active inserts in the pack that you already have. I’ve done this multiple times with Posters of Rebellion as well. It takes some patience on your part and trust that you will always be able to “flip backward” for the cards that you need but I promise you it works. If you pull an older insert that you needed then that’s great too. You’re not able to flip backward this time but at least your not massing a massive amount of dupes that you can’t trade. In the end, I’ve been able to complete the Naboo set painlessly and spending very little credits to do so. We want to use this part of the column to highlight past sets that you may not be familiar with. There are new users to the app every day and some of these past sets may be ones you are interested in. 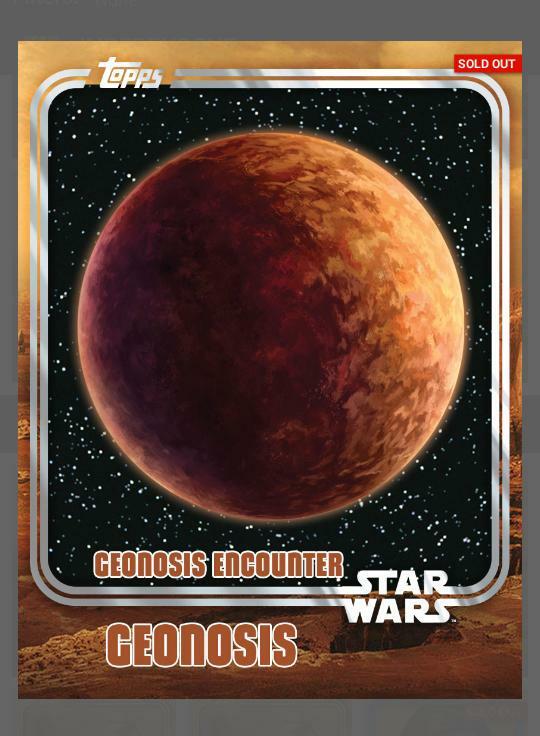 This week we will be highlighting Geonosis. The Geonosis Pack was introduced April 6, 2015 and ran a little over a month. It had ships, creatures and combatants that were all featured during those scenes in Attack of the Clones. 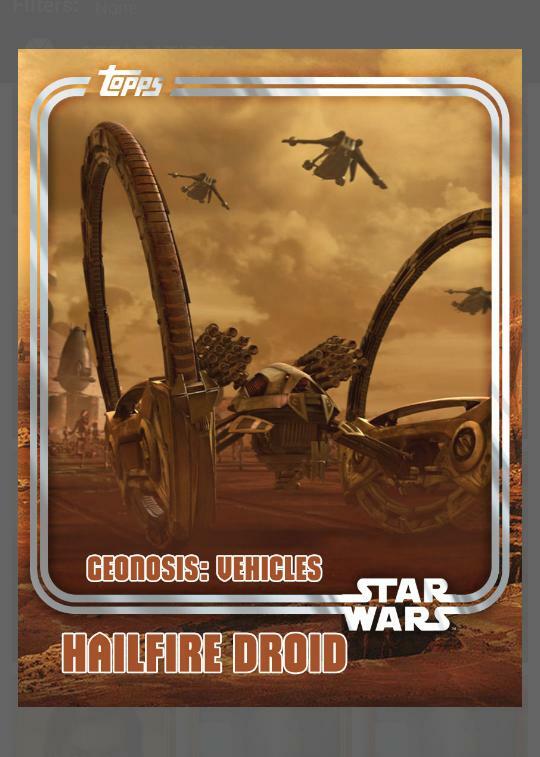 The cards are gorgeous and since ships and vehicles are a rarity in Star Wars Card Trader, its one of the only places to find them if you are a fan. These can be traded for fairly easy, but the Award Cards of the series are obviously harder to get. 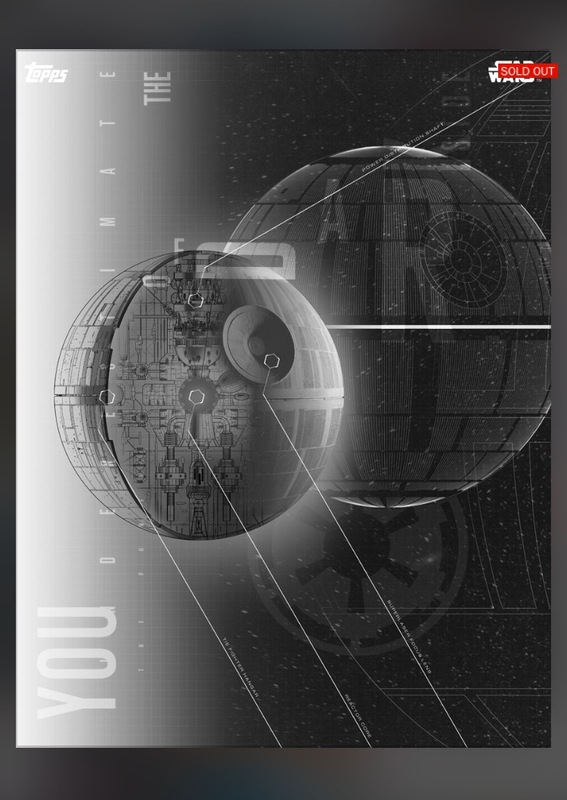 What makes this and the Hoth set unique, besides the many creatures and vehicles, is one of the Award Cards consisting of a picture of the planet. These are awesome award cards and we wish they were done more. Hopefully, Topps will get back to this type of set as there are a ton that would be fantastic. Imagine a set consisting of Tarkin, Vader, Death Star Droid, Mouse Droid and a Tie Fighter with the Award Card being The Death Star. Or a set with X-Wing Luke Skywalker, Biggs, X-Wing Fighter, General Dodonna and R2-D2 with the Award Card being Yavin. These are the types of locations sets that I would love to see. The Hoth and Geonosis Sets paved the way and it would be wonderful to see sets of this type return. Kind of a quiet week for Topps. However, we know that Topps is planning something very special for Force Friday on September 4th. As such, it seems like they might have used the past week as a chance to clear the decks and refresh. If anything, it’s nice to get a break from time to time and focus on older sets. Just because it’s older, it doesn’t mean it isn’t good. Look around at some of the ones that have struck your fancy and see about making a trade for them. They may just be one of the favorite parts of your collection.